Hello everyone! Sorry for not updating All Glammed Up much these past few months. I have been busy with work as my partner, Fashiometics, has been busy with school. But we're back and we're gonna be keeping the online alive and active again. And because Christmas and New Year is drawing near, we have decided to give you a little something, something. 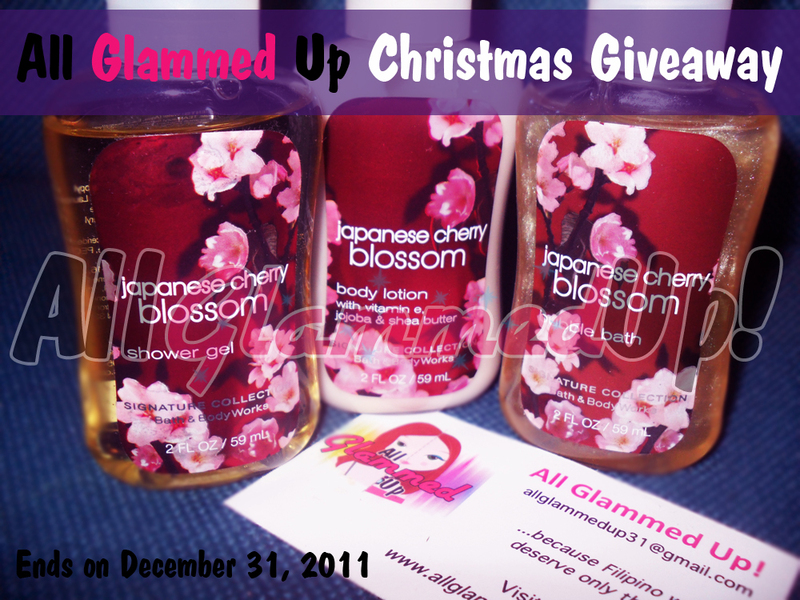 This giveaway will end on December 31, 2011 and is open to Philippine residents only. Oh, and don't forget to check out my business partner's blog: http://fashiometics.wordpress.com. She is a Filipina beauty anbd fashion blogger based in the US. She got great reviews and outfit posts! Just got your link from pinoy bloggers :) and saying hello! I'll join. :)) I hope to be lucky! I so want to win a giveaway! :) Thanks.